Today we speak with Matt Chappell, the owner and operator of Gather restaurant in Yarmouth, and Ari Solotoff, a lawyer with the Portland firm Bernstein Shur with a background in nonprofits and the music industry. Matt Chappell owns and operates Gather restaurant, a neighborhood eatery in the heart of Yarmouth’s village. 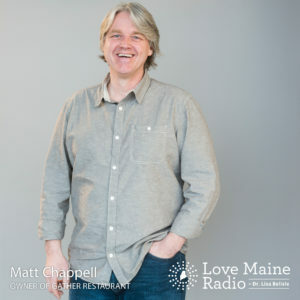 As a proud native Mainer, Chappell has intentionally pursued ways to make Maine the focus of his restaurant. 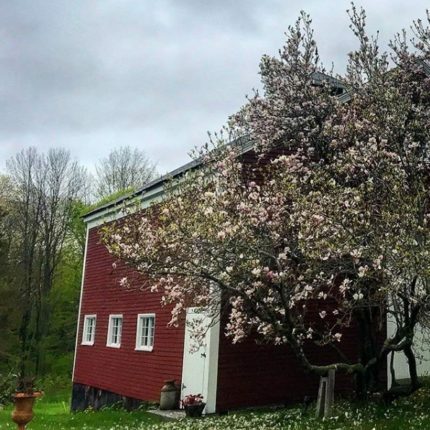 Whether it’s the food he procures from area farms, the musicians he books, the art he displays, or the vendors he chooses – all of it is meant to celebrate the bounty of the state. He credits his mother for his love and curiosity of food, and his father for modeling a community-centered business approach. He and his partner Wendy are currently blending families and building a new house in Yarmouth. Ari Solotoff is a business and entertainment lawyer with the Portland firm of Bernstein Shur. As a lawyer he focuses his practice on nonprofit law and copyright law, with an emphasis on music copyright and licensing matters. Solotoff represents a variety of musicians, ensembles, music publishers, and other creatives, as well as a diverse range of nonprofit and tax-exempt organizations. 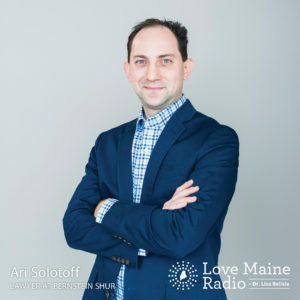 Solotoff earned his law degree from the University of Maine School of Law in 2015 and holds a Bachelor’s degree from the University of California, Berkeley. Before becoming an attorney, he served for over a decade in leadership positions within the classical music industry, including as executive director of the Portland Symphony Orchestra, the Pensacola Symphony Orchestra in Florida, and as executive vice president of The Philadelphia Orchestra. A native of New York and California, Solotoff lives with his family in Portland’s Back Cove.